An espalier (pronounced "es-PAL-yer")is a plant that has been trained to grow in a flat plane against a wall,fence, or trellis, though the term has also been used to describe the technique of training a plant to grow this way. The technique was invented by the ancient Romans, and further developed in Europe. This technique allowed them to take advantage of the thermal mass of south facing walls (full sun in Northern Hemisphere) by growing fruit trees against them, the heat retained by the walls protected the trees from the cold and extended the productive period of the of fruit trees. As the technique eventually became an art form in itself, the trees became a kind of living sculpture, and many ornamental trees and plants were also used as espaliers. The main benefit of the technique of growing espaliered trees is that they save a lot of space. You can grow a productive tree in a space that would otherwise be too narrow to be of use, or you can line up trellises in an open area, a few feet apart, running north to south so they dont shade each other, to create a very high density espalier orchard. Espaliers have also been used to create living fences. A fruit bearing fence fits in with the permaculture principle that "everything has more than one purpose or function" very nicely. You can virtually grow any plant as an espalier, it’s just a matter of maintaining a two-dimensional form by training all growth along a flat plane and pruning away any growth that can’t be laid flat because of the direction it’s growing. Some plants are particularly suitable as espaliers. Plants that produce many flexible lateral branches and attractive flowers, fruit, and foliage and/or bark are excellent choices for espaliers. The first step to espalier a tree is to construct a support for it. 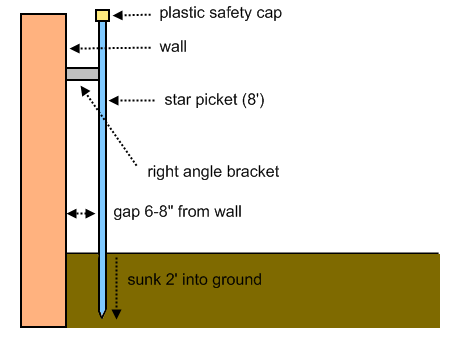 The following instructions will guide you through constructing an espalier support against a wall, using readily available materials. If you are constructing an espalier against a wall, you need a wall that receives full sun at midday. In the Northern Hemisphere, this is a south facing wall. In the Southern Hemisphere, this is a north facing wall. As I’m located in the Southern Hemisphere (Australia), I will be using a north facing wall in the example described. 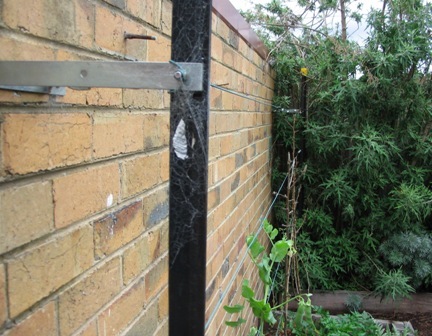 Here is a picture of my espalier support, against the north facing side of a garage wall. You can just make out the two young pear trees against the trellis. From this overhead angle, it’s easier to see things more clearly. An espaliered Nashi pear on the left with two branches and a Williams pear with four branches on the right (they are pollinators for each other). It’s their first year, so they still have some growing to do. You can see the brackets holding the support posts away from the wall. The support wires need to sit about 6" to 8" (15-20cm) away from the wall to prevent the leaves of the tree getting burnt when the wall heats up to very high temperatures under the full summer sun! Here, I’ve highlighted the positions of the support wires in yellow, to show how the espalier support is constructed. Star pickets come pre-drilled along their length, so the wires were strung in these pre-existing holes, roughly 1′ (30cm) apart, leaving a slightly larger space at the bottom, around 2′ (60cm). The diagram below shows how the espalier support is constructed, less the support wires. Two of these supports need to be constructed, one on either side of the wall, and the wires strung and tensioned between them. 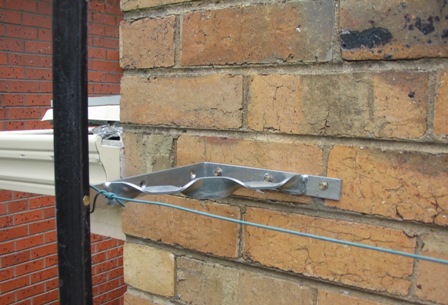 Fasten the brackets to the wall (using masonry anchors if it sis made of brick or concrete) at the same height. Line up the star picket the correct distance from the wall so it lines up with the bracket, and rotate it so that the edge with the holes is facing the wall. This is so the bracket can bolt to the star picket. Slowly drive the star picket into the ground, aim to drive about 2′ (60cm) into the ground, but make sure you stop driving it in when a hole in the star picket lines up with the hole in the bracket. Bolt the bracket to the star picket, using a nut and washer or lock washer so that it doesn’t loosen. 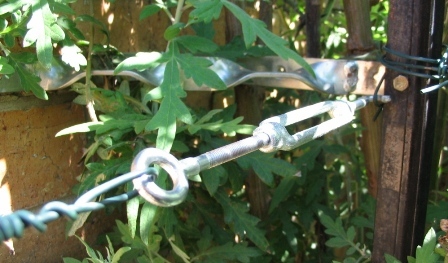 String up wires, one at a time, starting at bottom and working upwards, tie through hole in star picket (see details below), tie to turnbuckle, then fasten turnbuckle to opposite post and lightly tension. When all wires have been strung, tension them all up, from the bottom ones, working upwards. Use the heaviest brackets you can, make sure they have the cross-bracing running from one end to the other, forming a closed shape like a triangle. The plain "L" shaped brackets aren’t as strong as these. Both the brackets sideways, not vertically. Once you add the wires and tension them up, they will be exerting a sideways force to pull the support poles inwards to wards each other. A bracket which runs horizontally is more strongly braced against a horizontal force. Use all the holes in your brackets to mount them on the wall. If each bracket has three, use all three. If you’re tempted to just put two in, remember, you can make the thing 30% stronger for very little more effort! Braced bracket for extra strength, mounted horizontally and facing inwards for maximum strength. One bolt fastens the star picket to the bracket. Since the bolt occupies the hole on the star picket, the wire is fastened around the end of the bracket. Barrel roll tie is used to fasten the wires to one side, in this case the left star picket, turnbuckles used on the other end on the right hand side. Using turnbuckles with a hook on one end makes for quick attachment, just put the hook ends into the holes in the start picket (make sure you get the largest turnbuckles that will fit in the star picket holes). 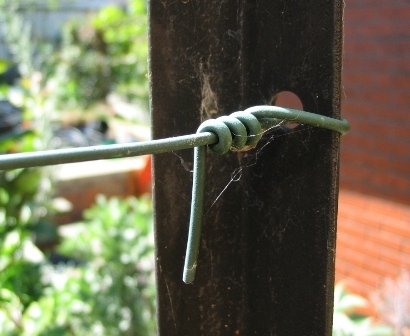 Wire attached to the eyelet end of the turnbuckle using a Haywire Twist and Barrel Roll tie. The Haywire Twist and Barrel Roll tie with a clearer background (my sleeve)! You will realise that you can’t attach the turnbuckle hook through the hole in the star picket where the bracket is attached. 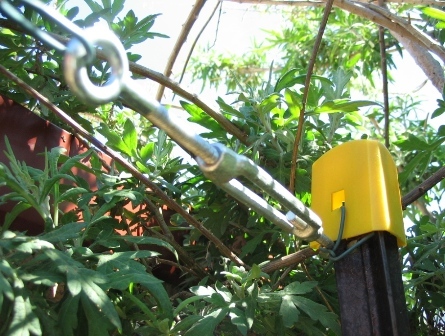 The simple solution is to simply tie a small loop of wire securely around the bracket, and fasten it to that, as shown below. Wire loop used on very to also, as plastic safety cap obscures top hole! Now that the trellis is complete, you’re ready to plant the tree, and train its branches along the trellis wires, and that will all be described in an up and coming project on this site! Please note that some of the extra details and construction tips in the Grape Vine Trellis project may helpful in the construction of this project, so please check it out here. I’ve just seen it in a young man’s place in the Adelaide hills inside a fruit avery, a place like for bird’s, but this site is for keeping every kind of bird away from ruining the fruit before it is ripe. I’m probably to old to start it now, I’m 64 years old, may ask The Lord to do it with me with the tree’s I already have, some are over 20 years old of the few that I have, one is a 3 variety apple tree, 1 apricot, 1 very large fig of the same age, have also younger trees 1 each of manderine and orange. It is all very interesting, but I’m probably to old for it all now. Many thanks, Mickola. I’m guessing you mean like an aviery, a completely enclosed structure covered with mesh. I’ve seen that before too. Luckily, you don’t need to go to those extremes, in permaculture we work with nature, and nature does provide a very effective bird deterrent in the form of a well-fed domestic cat! The birds still get the fruit higher up that you can’t usually reach anyway, and everyone’s happy! By the way, no age is ever to late to begin anything new if your heart is it it. I just turned 60, and started my trees two years ago. I’m going to learn grafting next. The standing stone, in the middle of the circle of apple trees , will be there long after I’m gone. This is a very helpful site – thank you! I have learned about espalier but would not have known anything of how to Acutally go about it. thats a great help – thanks! Thanks for all the detailed information. My husband and I are looking to plant concord grapes this year. Is this style of support system appropriate for grapes? Yes, this trellis will work fine for grapes. I have also written instructions specifically for a Grape Vine Trellis , which is basically a smaller version of the espalier tree trellis shown here. 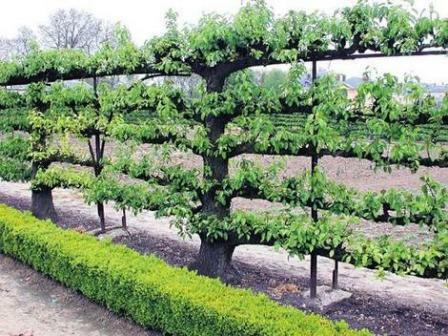 When you think of it, a grape vine trellis is just an espaliered grape vine anyway. The best size ultimately depends on how big you want to grow the grapevine! I regret that I couldn’t bring Evan over for your last open day – he wasn’t in Victoria that weekend. It would be great if you had time to upload pictures of how your handsome trees are training up. PS. Where you bolted the support bracket to the star picket: Was the hole that was already in the picket big enough for this job or did you have to drill it to widen it? Hi Anji, the holes in the star pickets were big enough to put the bolth through, but in some instances I have used star pickets where the hole was not large enough. In such cases it was very easy to drill the holes out a bit bigger, drills cut therough metal very quickly when they only have to cut on the edges of existing holes. Because I wanted to use star pickets for organic reasons (not treated pine posts) I found your site especially helpful. Thank you very much for your work in developing the site and in particular the photos. As they say, a picture is worth a thousand words. I, however, have one question. I notice you have support wires approximately every 30cm or so it seems from the photos, how did you make the holes in the star pickets. Can you buy the star pickets with the holes already drilled or did you use a special drill? Hi Greg, Thanks for the comments! The star pickets have holes in them already, running down one of the three sides only. This is because they are designed for fencing, and the holes are where the wores are strung through. Make sure you line up the side with the holes facing the other star picket before you hammer them in the ground sos that the sides with holes face each other. Thanks for taking the time to put together this unique information. I am looking to grow a living, espalier trellis on which to grow hops. Hops can be quite prolific, and standard hops trellises are known to be up to 18 feet. Do you have any suggestions as to what tree might be right to espalier into a trellis on which I could eventually grow hops? I grow my hops beside my espaliers, but run the hops along the wall of the house instead, supported by plant anchors that nail into the brickwork and use quick release plastic clips – they’re used for supporting climbers on brick walls. My hops were quite happy with this setup, visitors to the garden got some decent harvests for their home brewing! Firstly, because the tree has limited light exposure, being flat against a wall, you run the risk of shading out the tree with the vigorous growing vine, as both grow in the warmer months. Secondly, when hops grow, they tangle and entwine themselves pretty well around their supports, and when they die down in the colder months, you have to spend ages pruning away and untangling the dry, rope-like stems of the hops, and it takes a bit of effort. Mine ‘escaped’ and tangled its way around the pear trellis to its rght, and the berry trellis to its left, into a lemon tree, and across a garden bed into an elderberry shrub in a pot. I’ll confess it wasn’t fun untangling the mess afterwards. The standard practice is to give hops their own support, a long wire or two suspended between any two points above head height should work well enough for hops, make harvesting easier, and keep this prolific vine out of trouble! Hi I am trying to espalier my apple trees along the side of my drive way. I am using star pickets do how I get the wire tense and do I need to anchor the star pickets to the ground somehow? Thanks that’s exactly what I needed. I know now what to ask for and how to achieve the right result. From the comments I assume that this site is Australian–and I’m in North Carolina, US, so your north wall is my south. I’ve got a perfect south facing wall on my brick house from which I just removed a bunch of very gnarly old holly trees–now it’s wide open, lightly shaded by a crepe myrtles for part of the day. I am thinking it will be a great place for an espalier apple tree and have ordered one partially trained with 6 different apple varieties grafted to it! This will be rather a significant investment of time and $$ so I want to make sure the tree thrives. I guess if your wall is not too hot then mine won’t be? It gets up to 40C some summer days here, and that wall gets really hot! It won’t fry my apple tree, you think? » In the Northern Hemisphere, this is a south facing wall. » In the Southern Hemisphere, this is a north facing wall. As you correctly point out, you would use a south facing wall in the US. A wall facing the midday sun does get quite warm indeed, which is why we space the support 15-20cm (6″-10″) from the wall. If you use this spacing, it shall work fine, and if you really want to be on the safe sie, go with a 12″ (30cm) spacing from your wall if you have the room. That’s very kind of you to clarify in case other Yanks and assorted northerners find your site. 🙂 I think I will plant 12″ from the wall. And I think I’m going for a 3-in-one pluot rather than the apples. Pluots love heat, it seems. Fantastic site! I’m really, really enjoying reading through it. I’d love to espalier some fruit trees along a boring wall near my front door. I have 2 questions for you. My front yard is a concrete jungle – how could I modify your construction technique as to not need the star pickets? I am not able to secure them in soil due to a concrete driveway. Secondly, I would have to grow the fruit trees in pots – can you successfully meet the needs of espaliered fruit trees if growing them in pots? If your backyard is all concrete, and you have solid walls on either side, you can simply frill into the brickwork, screw in some eye screws or other suitable supports, and then string wires between them. You can grow and espalier treees in pots, but you have to use dwarf varieties, such as dwarf citrus trees, which work quite well. Figs and olives are the few full sized trees that can be grown in pots, most other trees cannot handle being root-bound. When growing trees in pots, get the biggest pots you can get, your trees will be happier in the long run. I am planning to create a Belgian Fence espalier along the side of my garage. Will plant 3 trees (donut peach & 2 nectarines). Will two Star Pickets be sufficient for the 24′ long wall or do you think I should use more? Hi Kathy, if you can get the posts (star pickets) anchored firmly enough, they will be able to support such a long run of wire under tension. If not, I would use four star pickets spaced 8 feet apart to give you support for three trees totalling 24 feet. Blackthorn you`re a real buzz !…the most descriptive site ever. I`m in Taree NSW,often too much groundwater,so figs in cut up old water tanks alongside house brickwalls for me….scroungers might like to use shells of washing machines..`fridges…stoves & the like…you can grow a small trailing plant to cover them.I also use corrugated iron & paint it green…putting fruit trees against walls also helps keep the flying fox away..we have thousands here. Hey Mickola,I`m 74 this year(2012)..growing keeps you going ! thank you so very much……….Clem. Love your site and your pictures/explanations. Been wanting to do this for a very long time. am now 53. i’m going to have my trees in containers as I am renting – but will plan to move them into a permanent site when I have a house again. Hi, thanks for your informative site. I live in Perth West Aust, and live near the beach, my backyard (courtyard) is brick paving with a wall running north south, with a lane way behind it, the area receives sun, mid morning, midday and part of the afternoon, I was hoping to put in 4 fruit trees (type to be determined) and your help here would be appreciated! They will have to be in very large pots, and was wondering if it’s not an ideal position, being on the west side of the house, with our 40+ temps in summer, and the possible heat reflection from the wall, brick paving and also a 2 storey house. All that thermal mass from the walls will heat up that area immensely, and considering that pots have a limited water supply, those trees will probably cook in summer, that is a very hostile environment for plants. There is a simple solution though, add some shade! If you can get some 50% shade cloth (this is for plants, not the regular 70% or higher rated ones for people!) and position it appropriately so the trees are saved from the full impact of the sun, and they’ll do fine. Put in a basic irrigation system on a timer for the pots so they will water themselves in summer and it should all work fine. My posts are in. Hardware ready to go. Brought home a young Honey Crisp apple tree this morning! Thank you….this website helped me as well….all the way from Calgary, Alberta, Canada!! Excellent, great to hear, thanks! Am also here from Calgary, Alberta Canada. Thank you for the helpful details about espalier-ing! To my fellow Calgarian, where did you purchase the espalier-ready Honeycrisp tree? Susannah – you may find siloam Orchards in Uxbridge, Ontario helpful. Not sure if they mail order but I have 15 starts on hold with them now. A call might not hurt. They have about 300 varieties of Heritage breed apples available in their private nursery. They do a fall pickup day in October once the stock has gone dormant. Hi Blackthorn – I hope you don’t mind, but I have linked this page to a gardening forum as you have posted such great instructions for starting an espalier. Hopefully my attempt will be as good as yours! Cross-post is here: http://forums.delphiforums.com/sproutoff/messages?msg=922.1 I will remove it if you request it. I hope this doesn’t offend you. No problem, that’s fine, I don’t mind. As long as it get’s more people gardening I’m happy! Hi, love the site. Am planting apple trees soon… I plan to espalier. A question…as the trunk grows and lengthens, do you have to adjust the branches up higher and higher on the support? Or does the length coming from the top keep getting bent into branches. I guess what I’m asking is… Will the trunk lengthen from the bottom? Or does it only add girth? The trunk of the tree only increases in girth, it gets thicker, but everything else stays where it is, the position of the branches stay where they are, as the only increase in height comes from new growth at the top. Once the espalier is topped at the height you choose, it just puts out new branches and fruiting wood. hi – i’d like to espalier a bull bag magnolia and some camellias. it’s adjacent a stucco house and the owner does not want to penetrate the stucco. do you have any recommendations on how to build a support that is not connected to the structure but still adjacent to it? maybe iron posts set in concrete with a few cross supports? That’s exactly how I would build it! 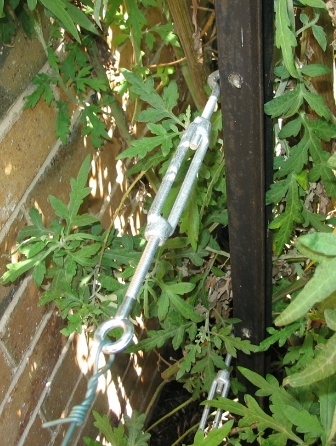 Use galvanised iron posts are set in concrete about 30cm (12″) from the wall. You shouldn’t need cross supports, just string wires between the two posts, as an espaliered tree doesn’t place that much weigh on the support. Blackthorn’s suggestion is great – around here we call them T-posts, and they come with holes already in them, which would work great for attaching the wires to. Personally I am not a fan of concrete for setting posts as it is a pain to remove if the day ever comes to replace a post. In light of that I prefer to use stone dust or very fine gravel for post setting. It can be compacted and will hold up well, but when time comes to remove the post, the stone dust will allow you to dig it up again, and then the stone dust can be removed from the landscape using a shop vac or similar if need be. We built our espalier using a technique similar to Blackthorn’s on a wooden fence with bamboo forms, but I don’t see why your idea wouldn’t work. Do you know what design/shape the homeowner wants? Some may offer more rigidity than others. Thanks for highlighting that point. That’s the way I anchor posts, I don’t use concrete, using gravel compacted down allows you to make changes, and is more viable for people in rental properties as you take the trellis system out when you go. Espaliers aren’t the most productive form for a fruit tree, as the amount of fruit a tree can produce is proportional to the amount of leaves and branches it carries, and on an espalier there isn’t much, so as long as you keep that it mind the small harvest will be reasonable. Evergreen fruit trees need sun all year round, 6-8 hours minimum. Whether the olive tree will be happy there depends on how many actual hours of direct sunlight are available at the time of year when the tree is growing and fruiting. A deciduous tree will work better because it will be dormant in the winter period. You can only try and see. Depending on how big you intend to make your espalier olive, you can grow it in a large pot and that way you can move it if there isn’t enough light. Thanks for the explanation. I went to my local home depot and got all the parts needed to support a new espalier apricot here in my LA garden. Because I couldn’t find 8′ star pickets (or anything else that long), I decided to try using two angle brackets at each end of the support: one at the top and one at the bottom. I used Home Depot 18″ x 13″ shelf brackets (with the diagonal support) and used 6′ zinc plated steel angle iron (pre drilled with lots of holes) for the verticals. Jeff what sort of surface are you building your espalier against? Brick wall? Garden Fence? Open air? Different mounting options may work for different growing situations. I opted for 2X4 blocks secured to the 4X4 posts on our fence and it has worked well. Clicking my username will take you to our blog if you would like to see an alternate option. You will have to follow the espalier tags once there. Hi! I have enjoyed reading your site and learning about espaliering. 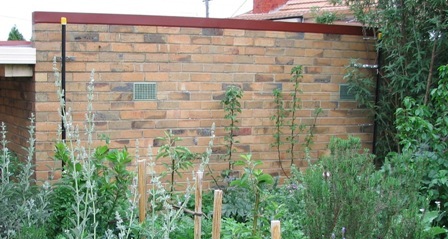 I live in a temperate climate (South Australia) and the only available space to espalier in my garden is a corner with one east facing wall and one south facing wall. I understand this isn’t ideal but wondered if it is suited to any variety of fruit tree? Perhaps apples / pear as opposed to citrus? Alternatively I could plant dwarf fruit trees direct in to the ground (I only have about 2.5m depth to play with) however I’m not sure whether this would make much difference? Any advice would be greatly appreciated thank you! Have you ever seen or heard of training eucalyptus to espalier or trellis? I wanted to trellis a young silver dollar euc as a privacy screen and shrub to six feet. I’d like an espalier in a stock container (those narrow oval metal things that they use on farms). I’d like it for privacy & would want it to provide it all year long. I could just put bamboo in the pot, but I love the espalier look. Any ideas? For evergreen espaliers you can use a citrus tree or one of the smaller growing olive varieties. Hi Kristin, I’m sure I haven’t done any instructional videos yet, but I’ve been planning on doing some for a while now on a range of topics! Pay attention to the turnbuckles used to tighten the wires. Most available at hardware stores have the middle part aluminum and the hook parts steel. Over time these dissimilar metals will fuse themselves together, making tightening impossible. You can reduce the problem by greasing the threads and/or finding turnbuckles that are all steel. Another option (available at farm stores) is a “ratchet tightener”. Thanks for bringing up this point, here the hardware stores only stock turnbuckles that are all steel thankfully! Great article- thanks. I have been told that it would be too much weight to mount espaliering on a wooden fence – that it would decrease the life of the fence and that I would need to build a support structure just inside the fence for it. I would appreciate your advice on this. Espaliers are only gently supported by the structure, I’ve propped up espaliers with broomstick thick bamboo lashed together with wire and it was enough to hold the branches in place, but such a structure naturally degrades after a while and will need replacing. As stated in the article, the espalier support must be space away from the fence or wall, but if you mean you wish to attach the support structure/trellis to the fence, then the answer is no, the fence will actually create a problem for the espalier… because fences don’t last forever, so when you have to replace your fence, what becomes of your espalier? I would recommend building a free standing support spaced away from the fence, you can anchor the posts in holes filled with gravel that is packed down, or concrete. Thanks Angelo, and thanks Chris. Chris, in your pic, I take it that the espalier structure is separate from the fence?- and therefore freestanding? Great pic, and the espalier looks fantastic! I am trying to create a deer fence and am thinking about creating a stand alone espalier fence to do this. I won’t mind if the deer eat much of the fruit from the outside and hope this will satisfy them and make them less prone to try to get over the fence. I’m concerned that the fence (trees) might not survive the deer in their early stages. I suppose I can protect them with wire during the early days. Thoughts? Sounds like a good idea to me! You could also see if you can espalier some ornamental deer-proof trees if you want less concern. Deer would not eat fig trees, the sticky latex in the sap is unpalatable to most creatures, and they espalier very easily, so that’s a viable option. They also don’t eat persimmon trees which are very ornamental and edible! Hawthorns are another possibility. I am just wanting some advice regarding espaliering against a main wall of my home. I haven’t been able to find any information regarding the root system and if there can be any issues with the house wall / foundations. Do you have any knowledge regarding this? A tree has a root system large enough to support the canopy above the ground. Espaliers are very minimal in terms of branches and leaves, so their root systems are not very large, which is why they can be planted against walls, which is where they’re planted traditionally. Have you seen/written any articles on how to espalier house numbers? Just use evergreen trees with highly flexible young branches that you can bend to any shape, such as any citrus, preferably small growing, small leaf varieties such as cumquats would probably work well. Hi, I have a southeast facing wall which receives full sunlight until appro 1300hrs, on which I want to espalier a Camellia sasanqua. The wall has a narrow garden bed in front 40cm wide, edged with concrete and stone. I do not want to remove the edging but I am worried the bed may not be wide enough for the root system especially after reading that the support needs to be mounted away from the wall. I live in Orange New South Wales so our summers are not extremely hot, is it possible for me to espalier against the wall and is this space wide enough for the root system. If your bed is 40cm wide, you’ll be planting your Camellia sasanqua at the point that is half the width, 20cm from the edge, which will be 20cm from the wall behind it. That far from the wall is fine, put your posts and supports at that distance and it will be right. It’s only morning and midday sun and the Camellia sasanqua will grow quite dense anyway. How expensive is the plant? Considering that espaliers are regularly startedf in containers that are a foot in diameter, your space should be adequate. The question is whether the cost of a failure is worth the risk. In my opinion, go for it! your framework needn’t be permanent, and you can treat it like a test run for other plants. You can espalier a tree against anything, even in open space with nothing around it, it’s the supports that hold the tree up, and if you anchor two posts anywhere and string wires between them, you can use it. In fact, some intensive espalier orchards consist of rows upon rows of espaliered fruit tree trellises so they look a bit like a grape vineyard farm. Could I use two star pickets that are 10′ apart? What about 15′? Hi, I’m looking to grow an espalier tree as a living fence and wondered how I’d go about doing that without a fence structure to work with. I assume two posts with wires would do as long as the tree could grow between them. All you need are two free-standing posts firmly anchored into the ground with wires between them. The important thing is to make sure those posts are not going to move under the tension of the wires or sideways if anyone leans against the espalier fence or the wind blows across it. Hi, thanks for all of this great information and for your responses which offer so much as well! I have two well established stand alone citrus trees and guess that an espaliered lime tree would go well on my north wall but I’m really drawn to Australian trees. Do you have any suggestions on what might work to achieve an aesthetically pleasing look with good coverage (for privacy) in my Victorian backyard or should I stick to the limes? Apparently there are Australian native trees and shrubs that can be espaliered. In the book ‘Espalier’ by Allen Gilbert (published October 2009, ISBN: 9781864471090, publisher: Hyland House http://www.publish.csiro.au/pid/6227.htm) there are quite a number listed, two pages in fact, along with details the shape and form to use for each one listed. Many Australian native plats and trees such as Acmenas, Syzygiums and Westringias can also be hedged for privacy screens. I am on our second spring with 9 espalier sod different types through our garden. We based the long NW wall set up on your instructions and 6 trees are safely set up there. One challenge I have this year is that both the quinces (Champion and Smyrna), have tended towards bolting up vertically, but not putting much growth on on the laterals, which are spindly on the first row, and almost non-existent on the second. Any tips? I am tempted to simply chainsaw prune back down to the bottom and start them again. Thank you for your site, I really appreciate your detailed and practical information. Hi Caroline, this is an article on constructing espalier supports, not how to espalier trees, there’s an art and technique to espaliering deciduous trees. If you’re going to espalier a deciduous tree you have to learn the basics of espalier, how each type of tree grows, and what age wood it fruits on. When espaliering any tree, if you tie down the branches horizontally, they stop growing and produce vertical shoots, that’s what they’re supposed to do, that’s how espalier works. Quinces fruit on the current season’s growth and often produce lots of long whippy growth which is also productive but can be summer pruned back to 3-4 buds or removed altogether if it’s crowding things a bit too much. 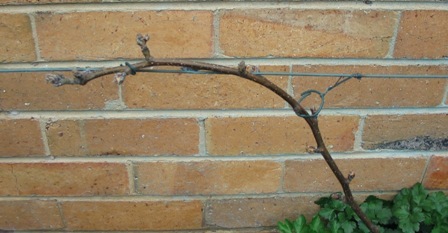 I’ve never grown quince, but here’s a nifty espalier trick I picked up from the great American Hort Society Pruning and Training manual and used on my peach fan this summer with success. To correct uneven development in a fan espalier “the more vigorous shoot can be lowered toward the horizontal to slow it’s growth. The weaker shoot can also be raised toward the vertical to increase it’s vigor. Once the two shoots are of equal length (usually by the end of the growing season) they can be returned to their original positions and training can continue.” Not sure this technique would solve your problem but might be worth a try. Thanks Kristin, that’s precisely what needs to be done! Thanks for providing this information. Hi Rowena, to support espalier trees, you can just use garden twist ties, tree tie fabric, C-shaped plastic plant clips, basically anything used to tie tree braches and vines. Whatever you use, make sure it’s not fastened too tight where it can cut into the bark, especially if it’s forgotten there. I’ve been using velcro strips. They seem to work fine. Where I needed branches to graft, I wrapped in electrical tape to hold them against each other. I’ve tried a bunch of things to tie branches to espalier supports. My favorite is the legs from nylon stockings! They’re strong, stretchy and gentle to tender bark. And it’s easy to make a nice figure eight to tie them on. 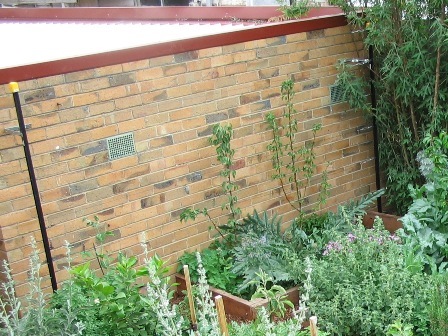 I was thinking of planting espalier trees in a narrow (30cm) garden bed between a timber fence and concrete path. The NW facing bed is about 13 metres long and the fence about four metres longer. Is the bed wide enough to accommodate a mature tree trunk? How close should I plant the trees for a simple 4 tier cordon – four metres? Would this be better suited to stone fruits, citrus, or apple/pear/quince? Hi Brian, espaliering a tree will restrict its growth and also the final trunk thickness, the trees will fit fine in such a narrow bed, what’s important is the direction for adequate light. NW facing is good in the southern hemisphere (not sure which part of the world you’re in), as the fruit trees will need a minimum of six hours sun when they’re in leaf. A 4m wide espalier is rather wide, around 2.5m would be more manageable. A four-tier horizontal-limb espalier works well for pome fruit such as apples, pears and quinces. Stone fruit, just European plums. Peaches, nectarines, apricots and Japanese plums are too vigorous and branch extensively, they only work as fan-shaped espaliers. Citrus as espalier is grown flat against lattice usually, it’s too random for formal shapes, the shape is well, ‘flat’, and that’s really it.